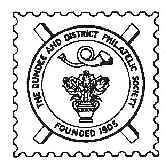 Dundee & District Philatelic Society held its Annual Dinner on Thursday 12th May at which a number of the members and their spouses attended. The dinner was held at the Invercarse Hotel in Dundee, and the evening soon warmed up with good food, drink and great company, and a good night was had by all. Peter Dix has been appointed as a committee member replacing Doug Howkins who has completed his three year term in the post. Following the AGM members tucked into drinks and cakes to celebrate the end of another highly successful philatelic year. At the meeting on Thursday night members were treated to a night of Philatelic Miscellany which has been organised by the Vice President David Millar and which was presented by three local members. David Millar opened the evening with a topic of Luminescence and Phosphorescence and providing an explanation as to what their uses were in relation to stamps of Great Britain and other countries of the world e.g Canada. David provided explanations of the various types of Fluorescence (or tagging as used in some countries) used and identified what tools could be used to identify the tagging e.g. Short Wave and Long Wave UV Lamps. David also explained that fluorescence could either be printed on the paper prior to printing the stamp or, on the stamp after printing. he also explained that iridescent inks are sometimes used as well. David finished his part of the display by discussing the use of microscopes which are useful for identifying thins and repairs to stamps which are not easily identified by the naked eye. Next up was Harry Jackson whose topic for discussion was Paper Texture. Harry outlined how paper was manufactured and the implications this has on philately. Harry then went on to explain the differences in the types of hand-made and machine-made paper. We then moved on to the different textures of paper namely, wove and laid paper with an explanation of the differences between each, which was also backed up with a computer display highlighting the differences. Harry finished off his part of the evening by covering the various paper varieties in use. The last display of the night was by Doug Howkins who gave an entertaining view of how to provide a display of the 20 Latin American countries by the use of a talk, stamp display and a slide show. The purpose of this being to highlight that there are a number of ways in which to display your stamps. At the meeting on Thursday night members were treated an entertaining display from a local member Harry Jackson. Harry has displayed parts of the display at previous meetings so it was nice to see him put it all together for one large display. The display consisted of stamps and covers from 1850 until just after independence with all being from stamp producing areas of British India. Harry explained that the display was in chronological order based on the dates of the first issue for each state. The display started with British India which included the first adhesive stamp issued in the whole of east asia. Also included were dies of the imperforate issue of 1854. Harry then progressed onto the European possessions of Portugal and France and followed this up with Nepal. Harry finished his first half of the display with Indian stamps issued abroad in such places as Zanzibar, Bahrain, Burma, Tibet, Straits Settlements. In the second half of the display Harry continued with displays of stamps and covers covering more of the Indian States, some of which displayed religious motifs, and others from Bundi which included sacred cow issues. The display then went on to cover the Independence partition states. Harry explained that in 1947/8 Britain withdrew and the countries of India and Pakistan were created, from which Harry displayed the first and seconds sets of definitives. These included pictorial motifs of buildings and, the five year plan on the second issue from India. Harry finished his display with issues from the new country of Bhutan and also some issues from Bangladesh. At the meeting on Thursday night members were treated an entertaining display from David Mekie, a member of the Scottish P.S. In the first half of David's display he covered two of the unfederated states of Malaya, namely, Terengganu and Johore. David informed members that Malaya initially belonged to Siam until Great Britain took over. Starting with Terengganu the display consisted of stamps and covers which included definitive issues, overprints and stamps covering the Malaya-Borneo Exhibition. David then progressed to Johore and again we wetre treated to stamps, some of which were provisional issues and plate proofs, and some postal stationary. The second half of the display covered another two states namely, Kedah and Kelantan. David explained that Kedah was the rice producing state and therefore their stamps usually portrayed items relating to rice production. The display showed stamps and postal stationary and also consisted of items relating to the Japanese Occupation during World War II. The final part of David's display covered the state of Kelantan and again consisted of stamps and covers of which some were Specimens. David explained that because of the heat the stamps were put on blotting paper to stop them sticking, but eventually the stamps then started sticking to the blotting paper. At the meeting on Thursday night members were treated to displays from two members of Aberdeen Philatelic Society, Joe Ritchie and Bruce Walker. Joe began the evening with a display of stamps and covers from Jammu of Kashmir. Joe began by providing a brief history of the state and how the first Maharajah created the first post office. The first stamps produced were circular stamps produced from 3 dies and were handstamped. Joes display also included what are termed Old Rectangular and New rectangular stamps. Jammu suffered from a lot of reprints and forgeries of their stamps. Indeed it has been found that some stamps were recreated using new dies but these dies have never been found. Joe then went on to display some covers explaining the postmarks and how GB also ran an external postal service at the same time. In the second display of the night Bruce Walker displayed stamps and covers from Aden and Zanzibar. The first part of his display concerned Aden with a display of a range of covers from 1880 onwards, with one letter being posted on the last day of the Indian Colony in Aden. Bruce displayed sets of stamps from the reign of KGVI and some military and censored mail. He then went on to show some stamps and covers from Zanzibar which again started with Indian Post Offices. Bruce then displayed stamps showing a variety of Sultans who ruled Zanzibar up to the revolution in 1964. Bruce finished his display with a series of covers from French and German Post offices (the German PO being short lived). At the meeting on Thursday night members were treated to displays from three members of Caledonian Philatelic Society, Lynn Robinson, Richard Beith and Colin Caskie. Lynn started off the evening with a display of stamps and postcards relating to the American Civil War. Lynn provided a fascinating insight into the background to the war detailing the significant battles which took place, such as the Battle of Harpers Ferry, the Battle of Bull Run. Included in the display was a letter from Lawrence Kansas and one from John Wilkes Booth (who shot to fame when he assassinated President Lincoln) when he was 16 which showed his aggressive tendencies even at that early age. Richard Beith followed on with a display of Censorship of Civil Mails in Czechoslovakia during the Munich Crisis September - November 1938. Starting with the Munich Conference Richard explained how Czechoslovakia began with the introduction of censorship on outgoing mail which extended to inward mail a short time later. Three different centres were used for censorship and each used different handstamps. Richards display was a series of covers, covering a 2 month period, showing the different handstamps through the 3 centres of Prague, Trencin and Brno. The display was completed with a selection of covers from Sudetenland. The final display from Colin Caskie was Canadian Pacific Rail Viewcards. The viewcards were used by the Canadian Pacific railroad to send out dividend information to investors. All the cards showed scenes from places the CPR operated in including CPR Hotels and restaurants. The cards ranged from 1901 right throught to 1912 and were all handwritten and posted to addresses in England and Scotland. The meeting on 28th January was a members night based on a theme using the letter 'M'. Charles Lloyd: Stamps from Belgian Congo, Rhodesia, Zimbabwe by a designer with the letter 'M' and stamps and covers from Mozambique. Dennis Collins: The hotel stationery from Switzerland and perfins from Mauritius and Morocco. Colin Campbell: Stamps and FDC's relating to Military. Robert Duguid: Montage on Miniature Sheets from Madeira. Doug Howkins: A miscellany: Monarchs, Costumes, Ships and Miltary Uniforms from Spain. Harry Jackson: Stamps from various areas of Germany. George Souter: A variety of stamps relating to the Olympic games venues Mexico, Munich, Montreal, Moscow. Alan Roy: Stamps from the Muscat and Morocco Agencies. At the end of the evening President Francis Podger presented Sandy Sloss with the Rosebowl as winner of the one-sheet competition. See news item for 12th December 2015. The first meeting of 2016 was the Annual Competition on 14th January at which members competed in four competitions for the Thematic Shield, the Postal History Shield, the National & General Shield and for the prize of winning the new Social Philately Shield. In the Thematic Shield there was only three entries. 'Scientists from the past', 'Railway parcel stamps from Rhodesia' and the winner of the Thematic Shield Doug Howkins with his display of 'Provincial Shields of Spanish Provinces'. There were no entries for the Postal History Shield. In the National & General Shield the entries were 'The canadian definitives of King George VI', 'Postal Slogans of East Africa' and 'Castles showing the different printers', and the winner of the Shield Harry Jackson with his entry of 'Stamps and covers from the Indian state of Jaipur'. The Social Philately shield was won by Charles Lloyd with his entry of 'Postcards from Belgian Congo related to a specific individual' which was the only entry. Pictures of the Winners being presented with thier shields can be seen on the Competition Winners page or click here... Below is a picture of the three winners with their trophies. This latest meeting on 12th December was the One-Sheet competition for members and a chance to show off their latest acquisitions. 14 members submitted a superb variety of entries for the competition. Runner-up was Harry Jackson with his entry of the first stamps issued by Sirmoor. The winner of the bowl was Sandy Sloss with his entry of the an 1845 cover from Dalmellington to Ayr which Sandy traced back to have family connections. Pictures of Sandy and his entry can be seen on the competition winners section of the web site following the Annual Competition next year. In the second part of the meeting 7 members displayed their latest acquisitions for the other members to peruse. Some of the displays covered stamps and covers from Belgian Congo, Jersey, Canada, Uganda and Aden States as well as a Central African Airways letter, Shipwreck letters, postal Stationary from Singapore and thematic stamps such as domestic animals, penguins and ships. The evening was finished off in traditional style with Christmas fare. At the meeting on Thursday night members were treated to displays from three members of Perth Philatelic Society, Ian Smith, Tony Cochrane and Paul Stephens. Ian started off the evenings entertainment with a display of Ceylon 'Chalons'. His display consisted of stamps from the reign of Queen Victoria between 1857 and 1890's, and covered the Perkins Bacon Issues as well as those with the 'Star' and 'Crown CC' Watermarks. Ian also displayed a variety of shades and perforations. He finished up his part of the display with some Postal History including a steamer letter from KANDY to London most probably from a missionary around the 1850's. This was followed by Tony Cochrane who displayed postcards mainly from Queen Victoria period related to Gunboats and Sloops from a variety of countries. In the second half of the evening Paul Stephens provided a display of Sudan Air Mail from 1931-35. Paul informed members that Sudan probably produced more Air Mail stamps than any other British Colony. His display then contained a large number of covers and letters into and out of Sudan using Air Mail. Included were stamps with overprints and first flight covers with cachets. Paul also displayed one cover which as well as having the Sudan cachet also had a Greece cachet on its arrival in Athens. Another cover was sent to the US from Sudan but via London. This cover was actually sent by Air Mail to London but was then transported to the US by Sea. Another cover had a number of cancellations and was also cancelled with 'sent by camel for delivery by pilot'. Paul finished his display with new stamps and air letters issued in 1950. At the meeting on Thursday night members were treated to two displays by the guest for the evening Jimmy Crawford from Bearsden & District Philatelic Society. In the first half of the display Jimmy presented a selection of postcards and score cards from Scottish Golf Courses starting with some golf courses in the Angus Area. Each course shown also displayed the date on which the course was registered with the Royal and Ancient and included the standard scratch score (SSS) used for competitions. The second half of the evening consisted of an entirely different display from the first. This display was a collection of covers all related to the Glasgow Penny Post and which were issued between 1829 and 1840. Jimmy explained that when the Penny Post started in Glasgow in 1829 there were 18 penny post offices. All offices were allocated a number based on their name alphabetically, therefore number 1 was allocated to Balfron. By the end of their use in 1839 there were 37 post offices, and as Jimmy explained this caused a bit of confusion as the numbers were reassigned to fit in with the alphabetic sequence of numbering the post offices. Indded it has been found that some post offices were allocated a few different numbers during the short period of use. Jimmy also displayed one cover which had three different numbers (numbers 17, 20 and 22) due to it having been returned twice to try to locate the recipient in another area. Last Nights' meeting saw members receive a display of Surprises in GB from husband and wife team Jan and Crawford Alexander. Jean and Crawford have both been collecting and displaying for over 50 years. Jean started off last nights' display with a variety of topics all related to GB. First up were a set of presentation cards which were first produced by Harrison and Sons in 1934 and which were commonly issued to members of parliament at that time. Included in this section were Coates Cards as well. Following this were more presentation cards and reproductions related to the Coronation issue. Then came Edward VII booklets showing advert panes and Shakespeare issue stamps. Jean also had on display some pulls from wood blocks used by David Gentleman as part of the design of the Shakespeare issue detailing the characters used on the stamps. Also on display were christmas stamps, cook booklets, a bacon booklet and 5/- booklets. Jean finished off her display with a selection of machin coil headers used by readers digest. Crawford started off his display with a selection of postcards and photographs of Tay Steamers on the Firth of Tay. Postcards of steamers such as the Shamrock and Marchioness of Bute, which used cachets and a selection of these were shown, indeed one of the cachets used by the Marchioness of Bute was one of the Bell Rock Lighthouse which unfortunately wasn't on show. Also on show were postcards of steamers from London City Council which were sold to Tay Steamships for work on the Tay. Crawford then switched to displays of Plating of Penny Reds, and a selection of Penny Reds with Maltese Crosses with a number in the middle. This was followed by Postal Stationery with Scottish Local Postmarks, and a newspaper wrapper for W.H. Smith. Last nights meeting saw members receive a presentation of Japanese Military and POW Mail from Terence Pickering. The display consisted of letters and postcards where all items on display were related in some way to the Thai-Burma Railway. Terence began the display with a brief history of why the railway was built and that it was a decision taken in June 1942 to commence the building of the railway. The initial letters in the display were related to Japanese Military Mail where all correspondence was related to the construction of the railway. This was then followed by Prisoner of War mail for prisoners held in the camps in Burma including mail being sent out as well as mail being sent to the prisoners who were either British Australian or Dutch. Included in this part of the display were a few letters sent from a Sgt Pike to his family indicating he was well. The second part of the display was a continuation of Prisoner of War mail but this time for those prisoners held in camps in Thailand. This included one letter issued to a prisoner who had escaped and the Japanese were requesting to return due to an outbreak of malaria. It was not allowed for prisoners to send letters from one camp to prisoners in another camp but Terence displayed one which managed to be sent out using one of the couriers. Another postcard on display sent out by a prisoner included a pencil drawn self portrait. Next on display were a set of letters for the civilian internees i.e the Tamils and Malays. The display was rounded off with a set of correspondence telling the story of Douglas Bolton from the time of his capture till his release and repatriation which included airgrams and telegrams. Thursday Nights' meeting of the society saw President Francis Podger FRPSL provide members with a display of 'Singapore Censored Mail 1939-1942'. The display covered mail into and out of Singapore including mail travelling through the country. Francis started off the display by explaining the history of when censorship began up until when Japan took over control of Singapore and Malaya, including how mail was used as a means passing information by using the number of stamps on the cover as a type of code. The display covered the changes in types of handstamps used from Boxed to official censor labels to stamps showing 'Passed by Transmission' as well as meter marks and triangular censors. Included in the display were covers showing anomalies in postage rates where the rates charged were wrong or underpaid. One cover on display had three different censor details from Singapore, Dutch East Indies and GB. Also on display were 5 covers which were inexplicably not censored at all. The display ended with a number of covers covering miltary mail. Silver for his Literature Entry of 'Singapore: The Use and Development of Revenue Impressed Stamps, The Victorian Era to 2012. Congratulations to Francis on his achievement. This page was last modified on 28th August 2018.